One-time production; while supplies last! National Farm Toy Museum 2018 Collector Edition. Features include die-cast body, hood, wheel inserts, and 3-point hitch. Additional features include experimental green wheel hubs, dash, and 3-point hitch gauge. "2018 NFTM" collector insert engraving. 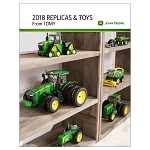 Only available through National Farm Toy Museum and John Deere Dealers.